Just so you know, I blog all the time. In my head anyway. I'm always thinking to myself "I could write about this, and that..." I do this while shopping, driving, attempting to sleep. Sometimes while actually cooking. And yet, many of these thoughts never make it to the computer. Such is life, I guess. But look at me go. How many blog posts in a week's time? Let's hope this trend continues. While flitting about on the internet the other day, I came across a post on Bakerella's site about blueberry cornmeal pancakes. I became intrigued. Mostly because I love blueberry pancakes, and just so happened to have some blueberries in my refrigerator. It was fate, I tell you. Monday night I whipped up a batch of the orange maple butter. It was not as easy as described. Sort of like mixing oil and water. Oh, wait... Anyway, I got it "mixed" and into the refrigerator. Tuesday morning - cooking time. Cornmeal in my pancakes was an interesting idea. How would it go over with the family (i.e. Sean). Time would only tell. I'm in the kitchen, gathering equipment, measuring ingredients, and I hear "what are you making?" Pancakes was, of course, my response. His? "I thought so. I saw the griddle. That only means two things it could be. Pancakes or grilled cheese sandwiches." Observant, that one. Was I going to tell him about the cornmeal? Nooooo. Was I going to get a blueberry near his pancakes? Nooooo. 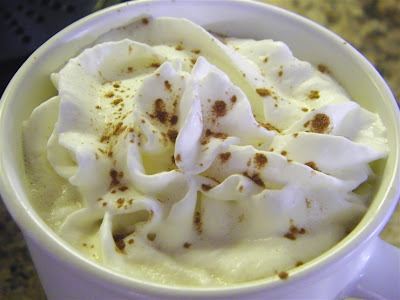 It's a very simple and straightforward recipe. And quite good. I (finally) tried the trick of keeping the extra pancakes warm in the oven. You know, it actually works! This will be going in my "keeper" file. 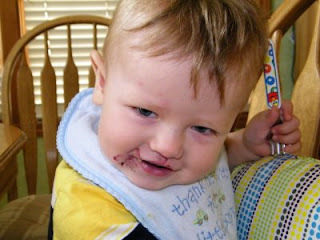 The non-blueberry pancakes were a hit with Sean. The cornmeal was not overpowering, but gave it a nice taste and texture. 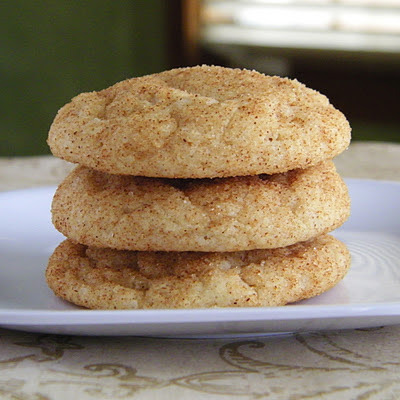 I don't know that I would have been able to tell it was cornmeal if I hadn't been the one making them. 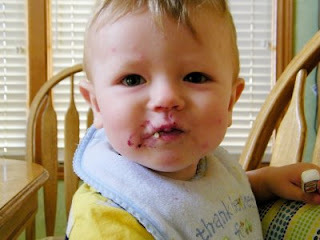 Note to self: strip Kade to his diaper before letting him feed himself blueberry pancakes. For the orange maple butter, combine all ingredients in a bowl with a rubber spatula. Scrape the mixture onto a piece of wax paper. Roll up and shape into a small log. Twist the ends of the wax paper to secure and refrigerate. For the pancakes, heat a griddle over medium heat. Run the extra butter over the surface of the griddle to coat (repeat as necessary). 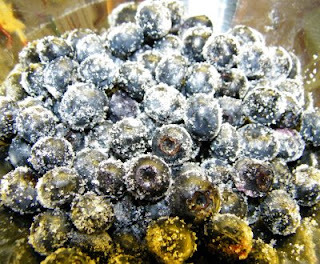 In a small bowl, toss the blueberries with 2 tsp sugar. Set aside. 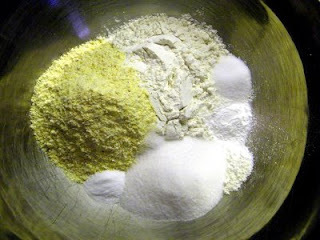 In a mixing bowl, whisk together the flour, cornmeal, sugar, baking powder, salt and baking soda. In a separate bowl, whisk together the buttermilk, milk, egg and butter. Add milk mixture to dry ingredients and whisk just until combined. 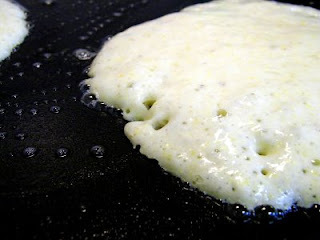 Pour batter onto prepared griddle 1/4 cup at a time. Add sugared blueberries to each pancake. Cook for 3-4 minutes. Flip and cook the other side for about 2 minutes. My boyfriend baked this one for me this morning! He knows I love pancakes and blueberries! Very delicious indeed.